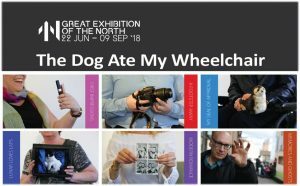 The Dog Ate My Wheelchair is a unique multi-screen video installation offering glimpses into the world of a group of north east people who identify as ‘disabled’ or ‘different’ as a result of mental and/or physical health impairments. Disability North have been working with established artist, Neil Armstrong, to bring together disabled people from the North East to converse about their everyday lives and the places in the region which inspire them. The project began with participants talking about objects which mean something to them in their everyday life, as seen in three video pieces facing outwards from Newcastle Central Library, Newcastle Haymarket, and Clayton Street. We later explored ‘place’ as a theme for discussion, and a longer film (with audio) sees three of the participants visiting their ‘significant places’ in the North East, including Tynemouth, Jesmond Dene and Gateshead. This can be found inside Newcastle Central Library. We hope the piece will stimulate conversation and provide a moment of contemplation for all who encounter it. Please do come along to discuss the project with the organisers and participants at Newcastle Central Library 4pm – 5pm on Monday 13th August 2018 in the Bewick Hall on level 2. Volunteers are being sought to help with a unique research project, funded through money raised by National Lottery players, which will explore the hidden and neglected heritage of British invalid carriages. Issued after WW1 by the government these vehicles were 3 wheeled hand powered. By the 1970s they were bright blue, 3 wheeled and provided by the NHS and for one person only. The government scheme closed in 1976. 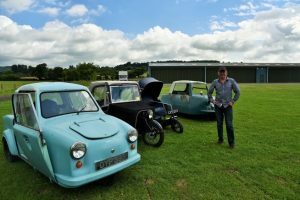 Simon Mckeown, a Reader in Teesside University’s School of Computing, Media & the Arts, has been collecting Invalid Carriages, or Invacars as some designs were known, for a number of years and has over 20 in his collection, dating from the 1930s through to the 1970s. His collection is one of the largest in the UK. . It is believed there are just over 300-400 left in the world today. Working with Kevin Wright of Disability North and through National Lottery funding, Simon will showcase over 100 years of British Invalid Carriage heritage, capturing the unique social, cultural and manufacturing heritage. Simon and Kevin are keen to record stories about the vehicles and their users and to recruit additional volunteers for the project to learn about and help support the cultural heritage of Invacars and carriages. Can you help? Did you or your family use an Invalid Carriage – Please tell us more. Would you be willing to be videoed? We can come to you. Do you have any old photographs, documents, or film of the carriages that we could have/use/lend/see? Would you like to volunteer? We need people interested in history / family history as well as photographers, cake makers, people to help make an exhibition happen and to look after it and more. We want your ideas and contribution. You can work from home, at Disability North or with Teesside University and the project can respond to your interests and abilities.